I assume that most people who read this blog and geek out about beer are familiar with RateBeer—the smartphone app and/or the website (RateBeer.com). Rating beers goes against my philosophy that beauty is in the hand of the beer holder. Weighing the merits of one beer versus another is largely a subjective endeavor. It’s all about what you like, not what the group likes. That said, I admit that I appreciate RateBeer, and enjoy the website and the app. If nothing else, I appreciate the literal nature of thing: RateBeer is where you rate beer. You can view the entire list here. Below, I share the Washington winners. While every place that is mentioned certainly deserves recognition, for the most part, lists like this only cause me to think about all the places that did not get top honors. And, seriously, Yard House got top honors as Washington’s number one restaurant for beer? That is interesting. Maybe I need to give them another shot? I am sure you have your own opinions about the merits of these places. That’s the whole point I was making in the first place. No doubt, if we composed such a list here on the Washington Beer Blog, using your opinions, the list would look different. Maybe I’ll do that some day… run our own little poll. I digress. Again, this list was compiled using the user ratings on RateBeer. This list is not based on someone’s opinion. A brewpub is a restaurant with it’s own brewery. A restaurant is a restaurant. Presumably, they are talking about a restaurant with a great tap selection. Brewery Taproom is a brewery with a beer-only taproom. Not a brewpub. Taproom, no food. Bar is a great beer bar. Of course there’s some crossover here. For instance, Brouwer’s is a great beer bar but also a restaurant. 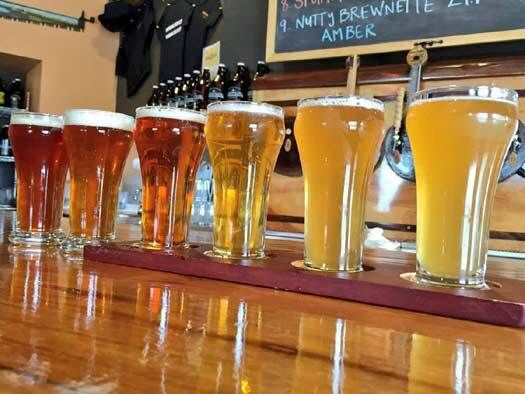 What is the difference between brewpub and brewery taproom? A brewpub is a restaurant that makes its own beer. Elliott Bay Brewing’s three locations are all example. A brewery that has a taproom, but no restaurant, is not a brewpub.